Cnut the Great (Old Norse: Knútr inn ríki; c. 985 or 995 – 12 November 1035), more commonly known as Canute, was a king of Denmark, England, Norway, and parts of Sweden, together often referred to as the Anglo-Scandinavian or North Sea Empire. After his death, the deaths of his heirs within a decade, and the Norman conquest of England in 1066, his legacy was largely lost to history. Historian Norman Cantor has made the statement that he was "the most effective king in Anglo-Saxon history", despite not being Anglo-Saxon. Cnut's name is popularly invoked in the context of the legendary story of King Canute and the waves, associated with the futility of "turning back the tide" of an inexorable event. Cnut's father was Sweyn Forkbeard, King of Denmark (which gave Cnut the patronym Sweynsson, Old Norse Sveinsson). The identity of his mother is uncertain, although medieval tradition makes her a daughter of Mieszko I. As a Prince of Denmark, Cnut won the throne of England in 1016 in the wake of centuries of Viking activity in northwestern Europe. His accession to the Danish throne in 1018 brought the crowns of England and Denmark together. Cnut maintained his power by uniting Danes and Englishmen under cultural bonds of wealth and custom, rather than by sheer brutality. After a decade of conflict with opponents in Scandinavia, Cnut claimed the crown of Norway in Trondheim in 1028. The Swedish city Sigtuna was held by Cnut. He had coins struck there that called him king, but there is no narrative record of his occupation. The kingship of England lent the Danes an important link to the maritime zone between the islands of Great Britain and Ireland, where Cnut, like his father before him, had a strong interest and wielded much influence among the Gall-Ghaedhil. Cnut's possession of England's dioceses and the continental Diocese of Denmark – with a claim laid upon it by the Holy Roman Empire's Archdiocese of Hamburg-Bremen—was a source of great leverage within the Church, gaining notable concessions from Pope Benedict VIII and his successor John XIX, such as one on the price of the pallium of his bishops. Cnut also gained concessions on the tolls his people had to pay on the way to Rome from other magnates of medieval Christendom, at the coronation of the Holy Roman Emperor. After his 1026 victory against Norway and Sweden, and on his way to Rome for this coronation, Cnut, in a letter written for the benefit of his subjects, stated himself "King of all England and Denmark and the Norwegians and of some of the Swedes". Cnut was a son of the Danish Prince Sweyn Forkbeard, who was the son and heir to King Harald Bluetooth from a line of Scandinavian rulers central to the unification of Denmark. Neither the place nor the date of his birth are known. Harthacnut was the semi-legendary founder of the Danish royal house at the beginning of the 10th century, and his son, Gorm the Old, was the first in the official line (the 'Old' in his name being to this effect). Harald Bluetooth, Gorm's son and Cnut's grandfather, was the Danish king at the time of the Christianization of Denmark, the first Scandinavian king to accept Christianity. Cnut's grandfather died when he was two years old and his father, Sweyn Forkbeard, became king. The Chronicon of Thietmar of Merseburg and the Encomium Emmae report Cnut's mother as having been a daughter of Mieszko I of Poland. Norse sources of the High Middle Ages, most prominently Heimskringla by Snorri Sturluson, also give a Polish princess as Cnut's mother, whom they call Gunhild and a daughter of Burislav, the king of Vindland. Since in the Norse sagas the king of Vindland is always Burislav, this is reconcilable with the assumption that her father was Mieszko (not his son Bolesław). Adam of Bremen in Gesta Hammaburgensis ecclesiae pontificum is unique in equating Cnut's mother (for whom he also produces no name) with the former queen of Sweden, wife of Eric the Victorious and by this marriage mother of Olof Skötkonung. To complicate the matter, Heimskringla and other Sagas also have Sweyn marrying Eric's widow, but she is distinctly another person in these texts, by name of Sigrid the Haughty, whom Sweyn only marries after Gunhild, the Slavic princess who bore Cnut, has died. Different theories regarding the number and ancestry of Sweyn's wives (or wife) have been brought forward (see Sigrid the Haughty and Gunhild). But since Adam is the only source to equate the identity of Cnut's and Olof Skötkonung's mother, this is often seen as an error of Adam, and it is often assumed that Sweyn had two wives, the first being Cnut's mother, and the second being the former Queen of Sweden. Cnut's brother Harald was the first born and crown prince. Some hint of Cnut's childhood can be found in the Joms, at their Viking stronghold on the Island of Wollin, off the coast of Pomerania. His date of birth, like his mother's name, is unknown. Contemporary works such as the Chronicon and the Encomium Emmae, do not mention it. Even so, in a Knútsdrápa by the skald Óttarr svarti, there is a statement that Cnut was "of no great age" when he first went to war. It also mentions a battle identifiable with Sweyn Forkbeard's invasion of England and attack on the city of Norwich, in 1003/04, after the St. Brice's Day massacre of Danes by the English, in 1002. If it is the case that Cnut was part of this, his birthdate may be near 990, or even 980. If not, and the skald's poetic verse envisages another assault, such as Forkbeard's conquest of England in 1013/14, it may even suggest a birth date nearer 1000. There is a passage of the Encomiast's (as the author of the Encomium Emmae is known) with a reference to the force Cnut led in his English conquest of 1015/16. Here (see below) it says all the Vikings were of "mature age" under Cnut "the king". Among the allies of Denmark was Boleslaw the Brave, the Duke of Poland (later crowned king) and a relative to the Danish royal house. He lent some Polish troops, likely to have been a pledge made to Cnut and Harald when, in the winter, they "went amongst the Wends" to fetch their mother back to the Danish court. She had been sent away by their father after the death of the Swedish king Eric the Victorious in 995, and his marriage to Sigrid the Haughty, the Swedish queen mother. This wedlock formed a strong alliance between the successor to the throne of Sweden, Olof Skötkonung, and the rulers of Denmark, his in-laws. Swedes were certainly among the allies in the English conquest. Another in-law to the Danish royal house, Eiríkr Hákonarson, was Trondejarl (Earl of Lade) and the co-ruler of Norway, with his brother Svein Hakonarson—Norway having been under Danish sovereignty since the Battle of Svolder, in 999. Eiríkr's participation in the invasion left his son Hakon to rule Norway, with Svein. [T]here were so many kinds of shields, that you could have believed that troops of all nations were present. ... Gold shone on the prows, silver also flashed on the variously shaped ships. ... For who could look upon the lions of the foe, terrible with the brightness of gold, who upon the men of metal, menacing with golden face, ... who upon the bulls on the ships threatening death, their horns shining with gold, without feeling any fear for the king of such a force? Furthermore, in this great expedition there was present no slave, no man freed from slavery, no low-born man, no man weakened by age; for all were noble, all strong with the might of mature age, all sufficiently fit for any type of fighting, all of such great fleetness, that they scorned the speed of horsemen. Early in 1016, the Vikings crossed the Thames and harried Warwickshire, while Edmund Ironside's attempts at opposition seem to have come to nothing—the chronicler says the English army disbanded because the king and the citizenry of London were not present. The mid-winter assault by Cnut devastated its way northwards across eastern Mercia. Another summons of the army brought the Englishmen together, and they were met this time by the king, although 'it came to nothing as so often before', and Aethelred returned to London with fears of betrayal. Edmund then went north to join Uhtred the Earl of Northumbria and together they harried Staffordshire, Shropshire, and Cheshire in western Mercia, possibly targeting the estates of Eadric Streona. Cnut's occupation of Northumbria meant Uhtred returned home to submit himself to Cnut, who seems to have sent a Northumbrian rival, Thurbrand the Hold, to massacre Uhtred and his retinue. Eiríkr Hákonarson, most likely with another force of Scandinavians, came to support Cnut at this point, and the veteran Norwegian jarl was put in charge of Northumbria. There was a battle fought at Penselwood, in Somerset—with a hill in Selwood Forest as the likely location—and a subsequent battle at Sherston, in Wiltshire, which was fought over two days but left neither side victorious. Edmund was able to temporarily relieve London, driving the enemy away and defeating them after crossing the Thames at Brentford. Suffering heavy losses, he withdrew to Wessex to gather fresh troops, and the Danes again brought London under siege, but after another unsuccessful assault they withdrew into Kent under attack by the English, with a battle fought at Otford. At this point Eadric Streona went over to Edmund, and Cnut set sail northwards across the sea to Essex, and went from the landing of the ships up the River Orwell to ravage Mercia. This initial distribution of power was short-lived. The chronically treacherous Eadric was executed within a year of Cnut's accession. Mercia passed to one of the leading families of the region, probably first to Bernicia, the northern part of Northumbria, was theoretically part of Erik and Siward's earldom, but throughout Cnut's reign it effectively remained under the control of the English dynasty based at Bamburgh, which had dominated the area at least since the early 10th century. They served as junior Earls of Bernicia under the titular authority of the Earl of Northumbria. By the 1030s Cnut's direct administration of Wessex had come to an end, with the establishment of an earldom under Godwin, an Englishman from a powerful Sussex family. In general, after initial reliance on his Scandinavian followers in the first years of his reign, Cnut allowed those Anglo-Saxon families of the existing English nobility who had earned his trust to assume rulership of his Earldoms. King Cnut greets in friendship his archbishop and his diocesan bishops and Earl Thurkil and all his earls... ecclesiastic and lay, in England... I inform you that I will be a gracious lord and a faithfull observer of God's rights and just secular law. (He exhorts his ealdormen to assist the bishops in the maintenance of) God's rights... and the benefit of the people. Harald II died in 1018, and Cnut went to Denmark to affirm his succession to the Danish crown as Cnut II, stating his intention to avert attacks against England in a letter in 1019 (see above). It seems there were Danes in opposition to him, and an attack he carried out on the Wends of Pomerania may have had something to do with this. In this expedition, at least one of Cnut's English men, Godwin, apparently won the king's trust after a night-time raid he personally led against a Wendish encampment. His hold on the Danish throne presumably stable, Cnut was back in England in 1020. He appointed Pomerania, was probably the target of Cnut's expedition. After this clear display of Cnut's intentions to dominate Scandinavian affairs, it seems that Thorkell reconciled with Cnut in 1023. When chess at a banquet in Roskilde when an argument arose between them, and the next day, Christmas 1026, one of Cnut's housecarls killed the jarl with his blessing, in Trinity Church, the predecessor to Roskilde Cathedral. His enemies in Scandinavia subdued, and apparently at his leisure, Cnut was able to accept an invitation to witness the accession of the Holy Roman Emperor Conrad II. He left his affairs in the north and went from Denmark to the coronation at Easter 1027 in Rome—a pilgrimage to the heart of Christendom of considerable prestige for rulers of Europe in the Middle Ages. On the return journey he wrote his letter of 1027, like his letter of 1019, informing his subjects in England of his intentions from abroad and proclaiming himself ‘king of all England and Denmark and the Norwegians and of some of the Swedes'. "Robert" in Cnut's text is probably a clerical error for Rudolph, the last ruler of an independent Kingdom of Burgundy. Hence, the solemn word of the Pope, the Emperor, and Rudolph was given with the witness of four archbishops, twenty bishops, and 'innumerable multitudes of dukes and nobles', suggesting it was before the ceremonies were completed. Cnut without doubt threw himself into his role with zest. His image as a just Christian king, statesman and diplomat, and crusader against unjustness, seems rooted in reality, as well as one he sought to project. In 1028, after his return from Rome through Denmark, Cnut set off from England to Norway, and the city of Trondheim, with a fleet of fifty ships. Olaf Haraldsson stood down, unable to put up any fight, as his nobles were against him for his tendency to flay their wives for sorcery. 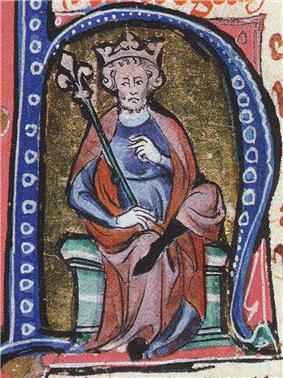 Cnut was crowned king, now of England, Denmark, and Norway, as well as part of Sweden. He entrusted the Earldom of Lade to the former line of earls, in Håkon Eiriksson, with Earl Eiríkr Hákonarson probably dead by this time. Hakon was possibly the Earl of Northumbria after Erik as well. It is difficult to ascertain whether Cnut's attitude towards the Church derived from deep religious devotion or was merely a means to reinforce his regime's hold on the people. There is evidence of respect for the Viking religion in his praise poetry, which he was happy enough for his skalds to embellish in Norse mythology, while other Viking leaders were insistent on the rigid observation of the Christian line, like St Olaf. Yet he also displays the desire for a respectable Christian nationhood within Europe. In 1018, some sources suggest he was at Canterbury on the return of its Archbishop Lyfing from Rome, to receive letters of exhortation from the Pope. If this chronology is correct, he probably went from Canturbury to the Witan at Oxford, with Archbishop Wulfstan of York in attendance, to record the event. Cnut's ecumenical gifts were widespread and often exuberant. Commonly held land was given, along with exemption from taxes as well as relics. Christ Church was probably given rights at the important port of Sandwich as well as tax exemption, with confirmation in the placement of their charters on the altar, while it got the relics of St Ælfheah, at the displeasure of the people of London. Another see in the king's favour was Winchester, second only to the Canturbury see in terms of wealth. New Minster's Liber Vitae records Cnut as a benefactor of the monastery, and the Winchester Cross, with 500 marks of silver and 30 marks of gold, as well as relics of various saints was given to it. Old Minster was the recipient of a shrine for the relics of St Birinus and the probable confirmation of its privileges. The monastery at Evesham, with its Abbot Ælfweard purportedly a relative of the king through Ælfgifu the Lady (probably Ælfgifu of Northampton, rather than Queen Emma, also known as Ælfgifu), got the relics of St Wigstan. Cnut's generosity towards his subjects, which his skalds called destroying treasure, was of course popular with the English. Still, it is important to remember that not all Englishmen were in his favour, and the burden of taxation was widely felt. His attitude towards London's see was clearly not benign. The monasteries at Ely and Glastonbury were apparently not on good terms either. Other gifts were also given to his neighbours. Among these were a gift to Chartres, of which its bishop wrote, "When we saw the gift that you sent us, we were amazed at your knowledge as well as your faith ... since you, whom we had heard to be a pagan prince, we now know to be not only a Christian, but also a most generous donor to God's churches and servants". He is known to have sent a psalter and sacramentary made in Peterborough, famous for its illustrations, to Cologne, and a book written in gold, among other gifts, to William the Great of Aquitaine. This golden book was apparently to support Aquitanian claims of St Martial, patron saint of Aquitaine, as an apostle. Of some consequence, its recipient was an avid artisan, scholar, and devout Christian, and the Abbey of Saint-Martial was a great library and scriptorium, second only to the one at Cluny. It is probable that Cnut's gifts were well beyond anything we can now prove. Cnut's journey to Rome in 1027 is another sign of his dedication to the Christian religion. It may be that he went to attend the coronation of Conrad II in order to improve relations between the two powers, yet he had previously made a vow to seek the favour of St Peter, the keeper of the keys to the heavenly kingdom. While in Rome, Cnut made an agreement with the Pope to reduce the fees paid by the English archbishops to receive their pallium. He also arranged that travelers from his realm should pay reduced or no tolls, and that they should be safeguarded on their way to and from Rome. Some evidence exists for a second journey in 1030. +Said to have been a great-granddaughter of Cnut's grandfather Harald Bluetooth, but this was probably a fiction intended to give her a royal bloodline. Cnut's skalds emphasize the parallelism between Cnut's rule of his earthly kingdom and God's rule of Heaven. This is particularly apparent in their refrains. Thus the refrain of Þórarinn's Höfuðlausn translates to "Cnut protects the land as the guardian of Byzantium [God] [does] Heaven" and the refrain of Hallvarðr's Knútsdrápa translates to "Cnut protects the land as the Lord of all [does] the splendid hall of the mountains [Heaven]". Despite the Christian message, the poets also make use of traditional pagan references and this is particularly true of Hallvarðr. As an example, one of his half-stanzas translates to "The Freyr of the noise of weapons [warrior] has also cast under him Norway; the battle-server [warrior] diminishes the hunger of the valcyrie's hawks [ravens]." The skald here refers to Cnut as "Freyr of battle", a kenning using the name of the pagan god Freyr. References of this sort were avoided by poets composing for the contemporary kings of Norway but Cnut seems to have had a more relaxed attitude towards pagan literary allusions. ^ Cantor, The Civilization of the Middle Ages, 1995:166. ^ a b c d e Lawson, Cnut, p. 97. 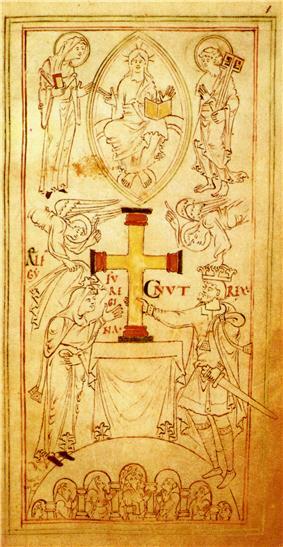 The Anglo-Saxon kings used the title "king of the English". Canute was ealles Engla landes cyning—"king of all England." ^ a b Ellis, Celt & Saxon,p. 182. ^ a b c Lawson, Cnut, p. 49. ^ a b c d e Lawson, Cnut, p. 27. ^ Campbell, A. (ed. & trans. ), Encomium Emmae Reginae, Camden 3rd Series vol.LXXII, 1949, pp. 19–21. ^ Anglo-Saxon Chronicles, pp. 146–9. ^ Anglo-Saxon Chronicles, pp. 152–3; Williams, A., Æthelred the Unready The Ill-Counselled King, Hambledon & London, 2003, pp. 146–7. ^ Frank Stenton, Anglo-Saxon England, 3rd ed. Oxford: Clarendon, 1971, ISBN 9780198217169, p. 399. ^ Lawson, Cnut, pp. 51-2 & 163. ^ Lawson, Cnut, pp. 124–125. ^ a b Forte, et al., Viking Empires, pp. 198. ^ Lawson, Cnut, pp. 95–8. ^ Lawson, Cnut, pp. ?? ^ Trow, Cnut, pp. 197. ^ Forte, et al., Viking Empires, pp. 197–198. ^ Trow, Cnut, pp. 197–198. ^ Lawson, Cnut. pp. 31-2. Lawson, M. K. (2005) . . 1035)"d"Cnut (. Oxford Dictionary of National Biography (online ed.). Oxford University Press.